Karpenko is describing his new work “inside the liminal,” to reflect the sense of occupying a position at both sides of a threshold. For Karpenko, these spaces in between—and their inevitably porous edges—exist on many levels. They can be literal places on the map, internal or external spaces or, in the technological realm, real and virtual arenas. 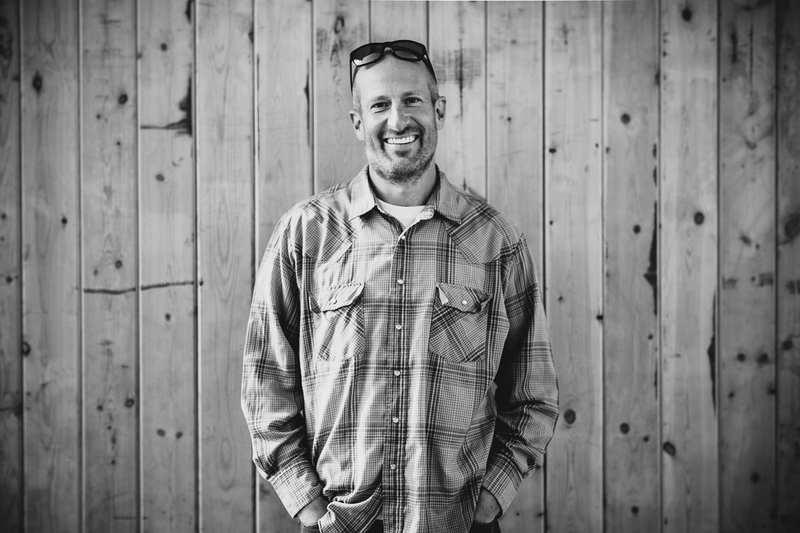 At its most literal, Karpenko’s new work is about traveling between the Methow Valley and Seattle, a trip he makes every other week to be with his eight-year-old son. His son spends the alternate weekends in the Methow. “I live and work here [in the Methow Valley], but my son goes to school in Seattle, so I journey in between places. My life is centered around him,” said Karpenko, who said exploring together has been the best of both worlds and an incredible way to experience the city. While Karpenko has been reflecting on the implications of this journey for some time, he is just beginning to translate those ideas into art. One of his first paintings on the theme depicts a highway arcing through the mountains beneath an expansive sky that, despite its foreboding weather and leaden gray clouds, is wide open with possibilities. Still, Karpenko has no explicit plan for how he will translate this straddling of different worlds into art. He usually works on a series of paintings, which allows him to develop an idea artistically and intellectually, but he isn’t inclined to set strict parameters or goals at the outset. Compositionally, the first painting about transition, with a sky almost exaggerated in its vastness, is in marked contrast to his recent mountain landscapes. Although being in the North Cascades can offer nearly infinite views, Karpenko’s mountain compositions tend to be constricted and protected. 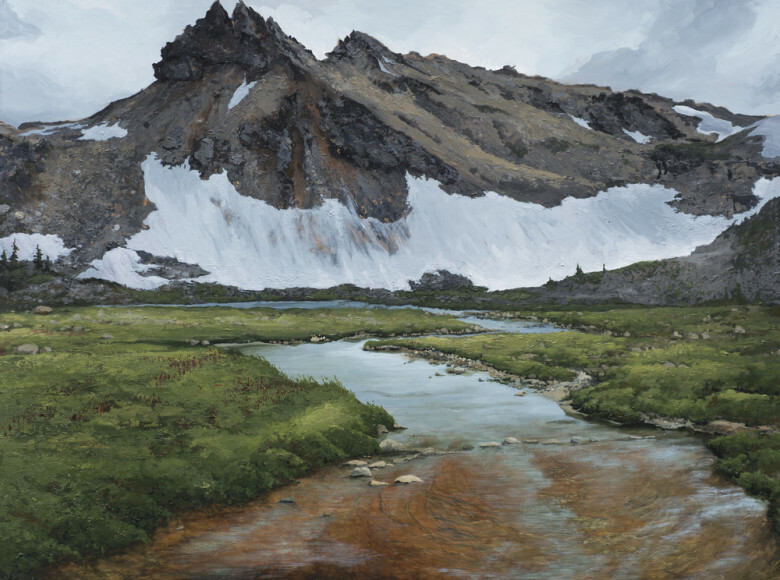 That painting, along with a cabin he built in the style of a North Cascades fire lookout, will serve as a literal bridge between worlds in an eight month exhibit in Seattle opening in June. 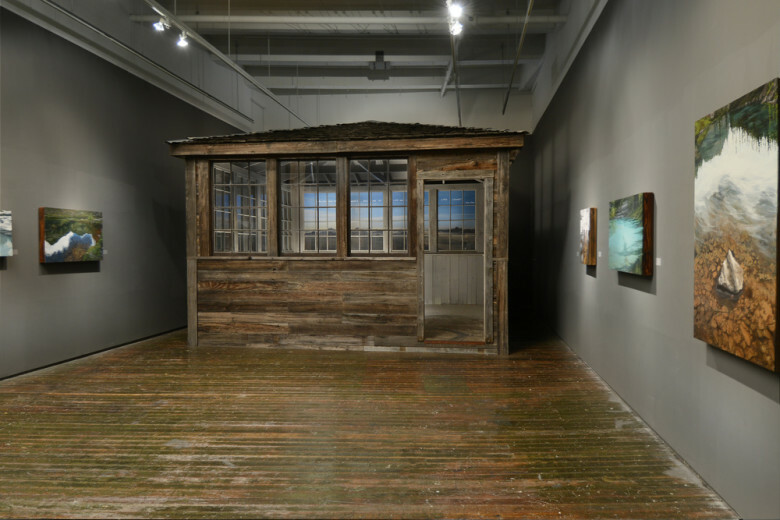 Visitors to the exhibit “Wild Nearby” at the Burke Museum of Natural History and Culture will enter through Karpenko’s cabin. One of the first things they will see is the exhilaratingly horizontal painting he created during the Carlton Complex wildfire. Not only will the lookout be an entryway to the exhibit, but the Burke is using it as a way of captivating young museum-goers by creating windows that frame selected objects, like rock samples they will be able to touch. The exhibit, based on the book The North Cascades: Finding Beauty and Renewal in the Wild Nearby, will also blend natural and human history. It will include plants and animals in the North Cascades as well as displays about the native peoples who lived in the area and the artifacts they created. The Burke opportunity is particularly exciting because it will attract a broader audience than an art gallery, said Karpenko. “I like the idea of people going into that lookout and seeing the painting. I hope it will inspire them to go to find a similar place themselves,” he said. The curators at the Burke share Karpenko’s goal of using art and artifacts as a link to a wilderness experience. After reading an article Karpenko wrote about his lookout series (published in the magazine of The Mountaineers, an outdoor-education organization), a Burke curator contacted Karpenko about including his work in their show. 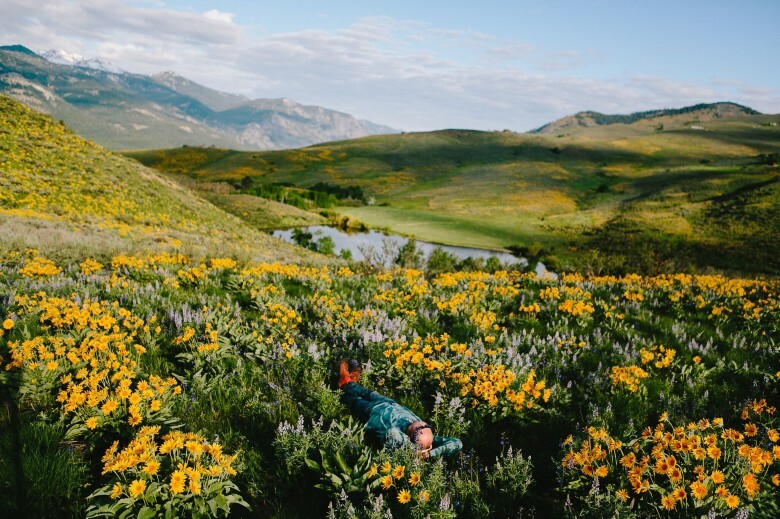 In the article, Karpenko gives an unflinching and thoughtful account of how the mountains provided solace and healing after his divorce, and how he translated those experiences into his art. Karpenko’s lookout and 12 paintings from the series were exhibited in the Traver Gallery in Seattle at the end of last year, but inclusion in the Burke show is a first for Karpenko—and, in some way, for the museum, which typically focuses on natural history. Building the lookout (outside, during the winter) was “totally crazy,” but it was a rich and deeply meaningful experience, said Karpenko. “The lookout is the most personal work I’ve ever done. It started out being a grieving process, but it’s been interesting to see others connect with it—it’s so much about finding peace of mind,” he said. Karpenko likes building things. The year he built his house south of Twisp was the best of his life. “It was my biggest art project ever,” he said. 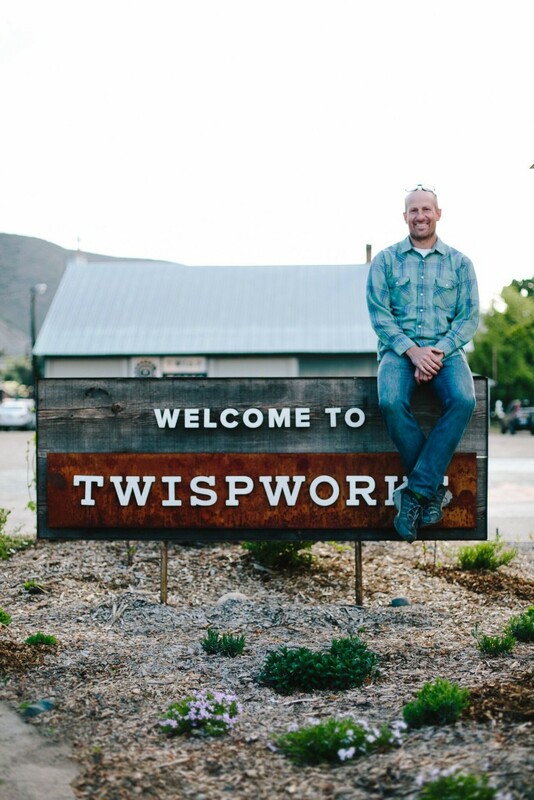 In the last five years Tori has also contributed his talents to TwispWorks as Director of Campus Operations. 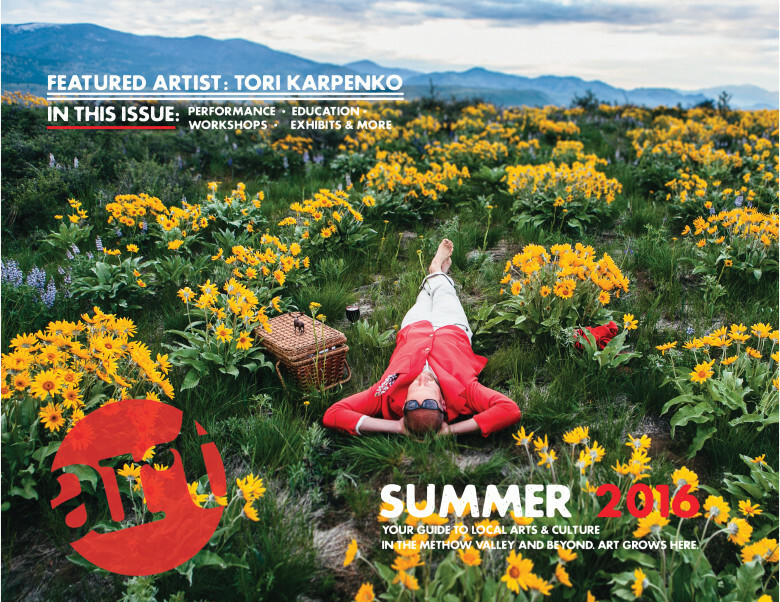 Working with staff, artists and businesses, Karpenko’s experience contributed to a number of renovations, building projects and beautification of the campus in downtown Twisp. For his mountain landscapes, Karpenko used Masonite as a canvas, which he lightly singed to lend an added depth to his subjects. But to depict our relationship with the real and virtual worlds, he is developing a surface that suggests a monitor or a screen. Karpenko has been experimenting with a stainless-steel “canvas” with rounded corners. Covered with a black base coat and layers of epoxy resin, the metal takes on an other-worldly sheen. “The presentation of the painting will look like a device, since the steel back looks like a monitor,” said Karpenko. Karpenko’s long travels across the mountains have sharpened his focus on connections between physical and inner experiences, but in many ways he has always made these kinds of connections. A key component of his artistic practice involves subconscious drawings, some of which become the basis for his acrylic paintings and mixed-media works. The subconscious approach to drawing is intentionally free-form and un-filtered in contrast to the more logical development of place-based paintings. 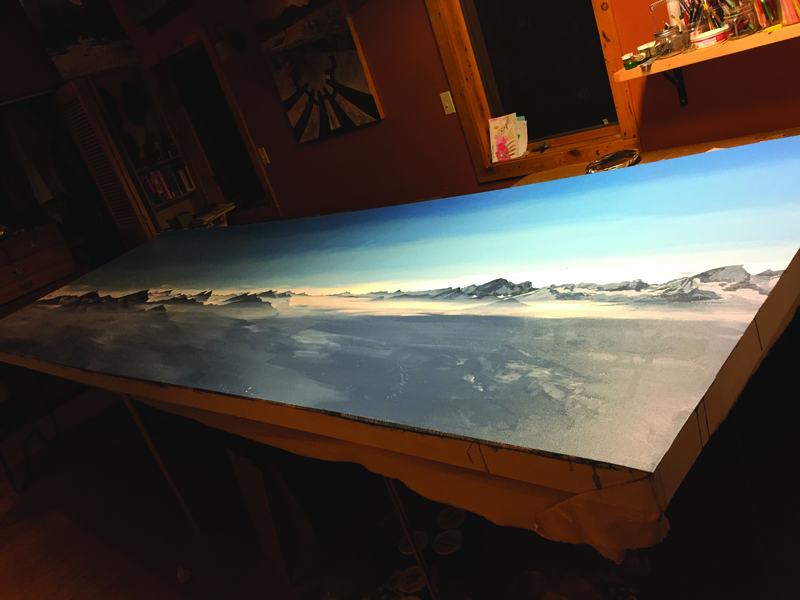 “ It’s important to me that part of my art making process is loose and less edited, otherwise certain images would never have a chance of coming to life,” said Karpenko. But some of the themes, like blending inner and outer worlds and the abstract and fantastical, have always been a part of his art. In the liminal series, Karpenko looks forward to exploring how these elements coexist—on many levels—in both life and art. FOOTNOTE: “Wild Nearby” is at the Burke Museum of Natural History and Culture in Seattle, on the University of Washington campus from June 18, 2016 through February 5, 2017. Find more of Karpenko’s work and history on his website www.torikarpenko.com.